Maltlevol-12 has been trusted and recommended by physicians for more than 50 years. 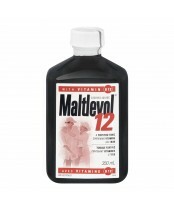 Maltlevol-12 is a liquid multi-vitamin that includes vitamin B12 and iron, in a specially formulated sherry wine base to stimulate appetite. It's an important daily supplement.